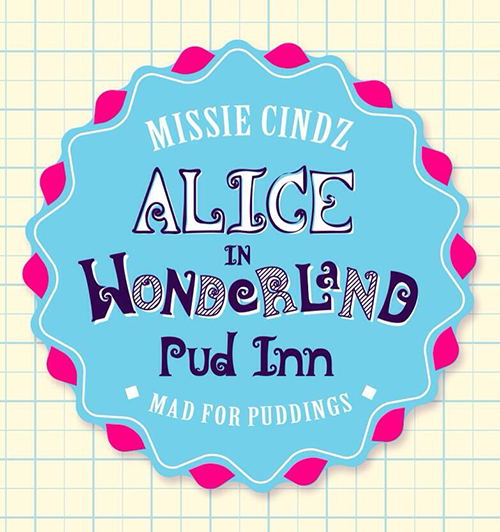 You are invited to attend Missie Cindz’s Alice In Wonderland / Mad Hatter’s Tea Party themed Pud Inn on Saturday 15th March held in The Rutland Arms (upstairs) starting 2.00pm – 4.30pm. FIVE deliciously comforting desserts guaranteed to make you lose your sweet tooth. A Mad Hatter’s Pud Inn Party’s a great way to celebrate an ‘un-birthday’ party – guaranteed to be smiling like a cheshire cat as you transport yourself to Missie’s (not Alice’s) Wonderland. What’s on the menu? – it’s a secret until the day of Pud Inn Club! This is a ticketed event and places are very limited, Pud Inn tickets are £8 per person and will be available to purchase at the bar from Monday 24th February or via email booking from 7am (emailing is advised). Sorry but I won’t be able to reserve tickets before this date. Please do look out for more event details on this blog, twitter by following the hashtag #MissiesPudInn or by joining and liking our facebook event’s page. Adding to the Pud Inn experience there will be a ‘RIP Diet: ‘Eat Me’, ‘Drink Me’, ‘Take Me’ Desserts Table; where YOU, the diner can bring in homemade Tea Party themed treats or shop-bought favourites for us to try and share. We like to try new things (and from what I’ve seen, diners are super adventurous too! ).